Railpictures.ca - Bill Thomson Photo: CN Pacific 5580 (a K3b built by the GTR in 1911) is shown on display at Riverside Park in Windsor back in May 1964, where it still resides on display today. In the background, one can see part of the old Wabash (later Norfolk Southern) rail ferry operation that operated between Windsor and Detroit until April of 1994, when the higher dimensional freight cars being ferried could now take the newly enlarged Detroit River Tunnel (remnants of the ferry docks remain as well). | Railpictures.ca – Canadian Railway Photography – photographie ferroviaire Canadienne. 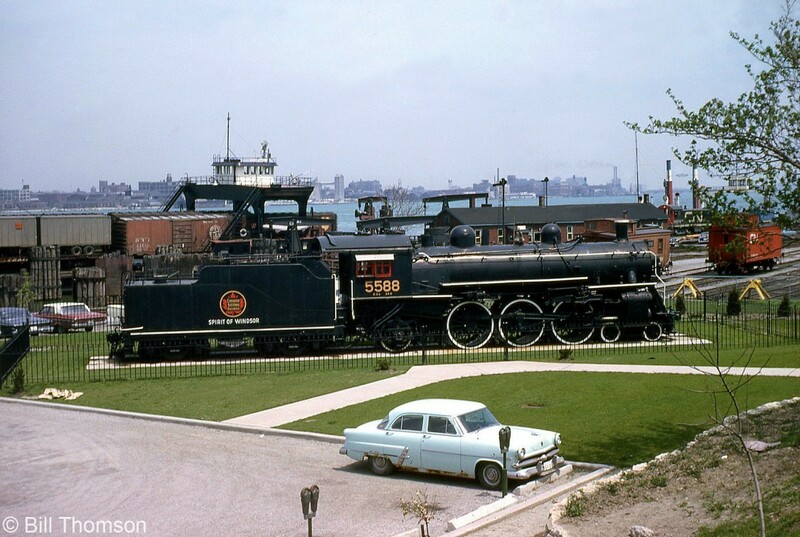 Caption: CN Pacific 5580 (a K3b built by the GTR in 1911) is shown on display at Riverside Park in Windsor back in May 1964, where it still resides on display today. In the background, one can see part of the old Wabash (later Norfolk Southern) rail ferry operation that operated between Windsor and Detroit until April of 1994, when the higher dimensional freight cars being ferried could now take the newly enlarged Detroit River Tunnel (remnants of the ferry docks remain as well). That would have been a great place to watch trains and ferries. Is that a boxcar red CN caboose I see? There is also a DT&I boxcar on the ferry. Also, looks like Ford had rusty cars before the 70’s scandal. Think that is a ‘53 so been the road 11 years by time the picture was taken and most cars were getting rusty by that age.